Are California climate policies unfair to Utah? 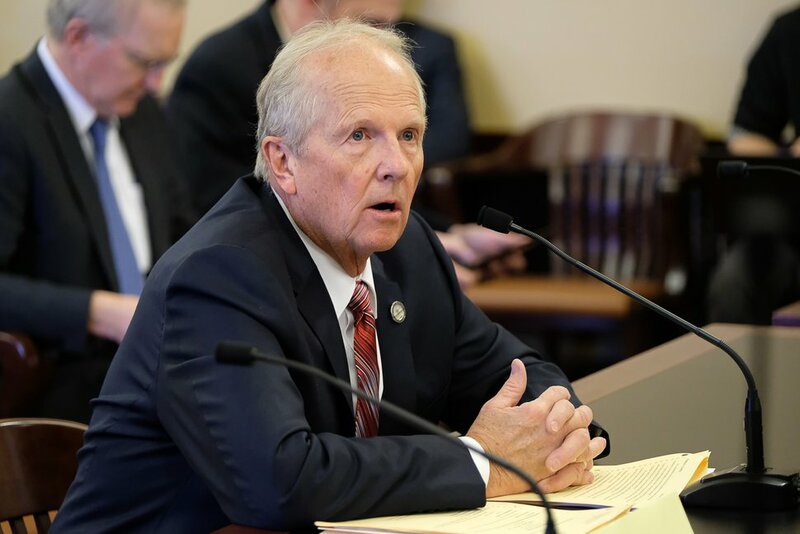 A Utah lawmaker is seeking $2 million to pay for lawsuits challenging the Golden State’s so-called “excise tax” on electricity generated from Utah coal. (Steve Griffin | Tribune file photo) Utah's largest power plant, the coal-fired Intermountain Power Project near Delta, exports most of its electricity to Southern California. But that state's cap-and-trade policies — aimed at reducing climate-changing carbon dioxide emissions — penalize coal-fired electricity because coal emits twice as much carbon dioxide as natural gas. Although the Utah plant is planning to convert to natural gas, one Utah lawmaker is calling for legal action against California, calling its program an illegal "excise tax" that is killing jobs in Utah. When Utah’s Intermountain Power Plant sells its electricity to Southern California, utilities there must pay an extra $15 per megawatt hour. That’s a special penalty on coal, a fuel that emits more heat-trapping carbon dioxide than any other. Now Utah Rep. Mike Noel wants to spend $2 million on private lawyers to sue California over that policy, which the Kanab Republican says amounts to an “excise tax” on Utah coal that is putting miners in Delta out of work. The point of the Golden State’s cap-and-trade program is to use market forces to encourage companies to reduce emissions. Companies are required to purchase allowances for each ton of carbon dioxide they release. “California has placed a $25-a-ton excise tax on all the coal that is burned in Utah for production of energy that goes to California,” Noel told Laura Nelson, Gov. Gary Herbert’s energy adviser, during a legislative hearing earlier this month. (Francisco Kjolseth | The Salt Lake Tribune) Rep. Mike Noel, R-Kanab, as seen Tuesday Tuesday, Feb. 6, 2018. Noel is among several rural lawmakers supporting a legal challenge to California's cap-and-trade program and its penalties on electricity produced with coal. But an official with California’s Air Resources Board said that was a mischaracterization. Critics of the cap-and-trade program contend it raises electrical rates for California consumers while providing no demonstrable benefits. Business leaders in the state have already filed legal challenges, but have lost so far. For California utilities, the program raises the price of power produced at the 1,800-megawatt IPP, which exports three-fourths of its output to six Southern California municipalities, with nearly half going to Los Angeles. The extra costs have power customers pulling back so the Utah plant’s output is now at its lowest ever, less than 8.8 million megawatt hours last year. While the IPP facility remains the leading consumer of Utah coal, its use has fallen to 3.65 million tons and unused coal is piling up. As of June 30, the plant had nearly $22 million worth of coal on hand, according to IPP’s latest annual report. At the hearing on Utah’s Capitol Hill, Noel demanded to know what the governor was doing about it. Noel accused Nelson of dodging his question, before answering it himself. “We are doing zero, OK, so I put in a $2 million appropriation request to file a lawsuit,” he said. Noel claimed Utah leaders are allowing California to dictate Utah’s energy policy at the expense of rural jobs and economic development. Employment at IPP has declined to 430 jobs, down from a peak of 620 back in the late 1980s. And the plant will convert to natural gas by 2025 — thanks to a prohibition on California utilities from buying coal power after current contracts expire, according to IPP company spokesman John Ward. “They can still use the coal, but they have to pay a penalty for it, so in the interim it makes the plant less economic for the California purchasers,” Ward said. But wider market factors are also at play that make coal a less attractive option in general, not just in California. IPP hoped to find new customers to take its power after California’s contracts expired. “It’s a big plant and there wasn’t an appetite to take on that much coal-fired electricity beyond 2025,” Ward said. The switch to natural gas was “unavoidable,” the company reported. After the conversion, IPP will employ fewer people — perhaps about 200 — because natural gas is less labor-intensive to burn than coal, according to Ward. He added that supplies of natural gas, which is a “fungible” commodity, may wind up coming from Wyoming as well as Utah. Ward said IPP managers are committed to preserving as much local economic development as possible during the transition. Noel contends California policies threaten rural Utah directly and will snuff out IPP. “We are letting another state control our economy,” he said, warning that California could one day place restrictions on Utah beef, products that rely on pesticides or even genetically modified foodstuffs. The current price for a California business to emit a ton of carbon dioxide is $14.74, a price that is subject to change in response to market conditions and California’s emissions cap, which drops by 3 percent each year. Applying current cap-and-trade prices to purchases by the Los Angeles Department of Water and Power, IPP’s biggest customer, the carbon penalty would amount to $61 million for the Utah-produced power it imported in 2017. Those allowances would have cost $32.4 million for power generated by natural gas or nothing for electricity from emission-free renewables or nuclear sources. The utility did not respond to requests for comment.